I bought a huge watermelon and was wondering what to do with it all, and came across Mary's post for this salsa, it was wonderful and just wanted to share it with you all. Thanks for the post on the salsa, and love your new blog photo when entering your blog. Have yourself a wonderful 4th of July. Great idea for watermelon. I can just imagine it would make a great flavor combination with the other ingredients! Nicely done. Perfect for a day like today. 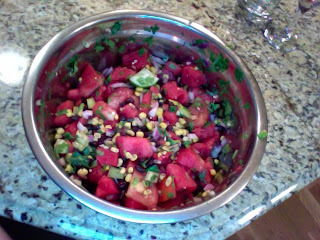 I wouldn't have thought of watermelon salsa, but it sounds really good. You're too funny. Glad you enjoy the holiday. My former landlord was from the UK, his wife from Atlanta, GA, so I asked him last summer what they were doing for the 4th. Boy was that a mistake! Oh yum that salsa recipe sounds good! I just got a watermelon also. I have some blueberries, I was going to mix them together and add some mint. But the watermelon is HUGE, I can do both! What a sweet and refreshing salsa! Happy 4th! 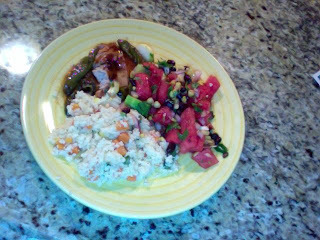 Gorgeous salsa and the whole dinner looks healthy and delicious and a perfect warm weather dinner. What an absolutely gorgeous salsa. I saw this on Marys site and felt I have to make it also. Thanks for leaving such a nice comment on my blog. I've been loving the watermelon lately, so juicy and refreshing for summer. Looks great!